Origin and Habitat: Southern Brazil, Uruguay, and province of Entre Rios, Argentina. Habitat: It grows in grassy plains or in low hills in lowland up to to1000 metres above sea levels. The climate is tropical, continental. Winter are completely dry, while in summer the landscape is flooded by torrential rain and soaked with water. Rainfall up to 1500 mm per annum. Average annual temperature 25-30 ° C. Rarely the temperature drop below zero degrees even if the landscape is open to the cold south pamperos winds. Echinopsis eyriesii grows among grasses and shrubs along with other cacti of the genera Notocactus, Gymnocalycium, Frailea, Cleistocactus and Cereus. Habit: Simple or (usually) clustered, branching basally. In time it may exceptionally forms large mounds up to 1,5 m tall and 2-3 m wide. Stem: Globular, later elongated and almost cylindrical, 15-30 cm high,12 to 15 cm thick, dark green and heavily ribbed. Notes: In the 19th century Echinopsis eyriesii was extensively hybridized with other Echinopsis and Lobivia species giving rise to a number of cultivars with big and colourful flowers. 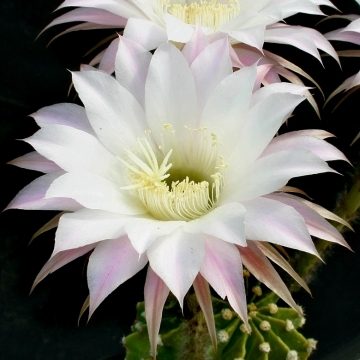 Cultivation and Propagation: Echinopsis eyriesii (and its forms and varieties) is very easy to grow and cold hardy as low as -7°C (or less). Growth rate: This species produces noticeable amounts of growth each year if kept well fed and watered throughout the warmest months, particularly if it has been acclimatised to accept full sun. Plants grown in the ground form soon imposing specimens. Waterings: Water the plants well and allow them to dry before watering again. This species seems to do better with a little more water than most cacti. 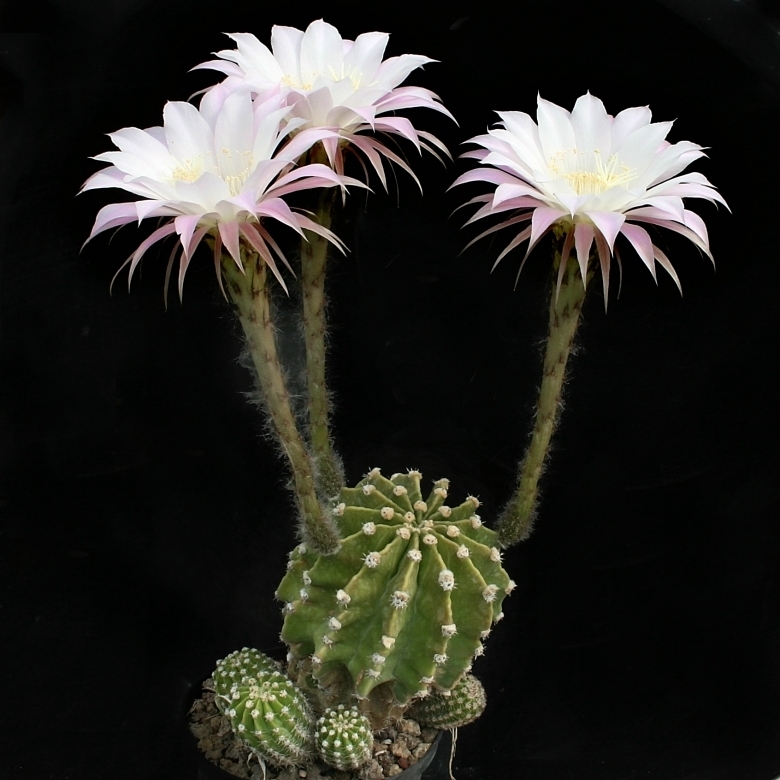 In fact, its cultivation requirements are really more like 'normal' plants than most other cacti. Pest and diseases: They are susceptible to fungal diseases if overwatered, but are not nearly as sensitive as many other cacti, especially in warm weather. They tend characteristically towards black rotted spots unless watering is moderate and only in hot weather, if kept damp through cold periods, they will invariably suffer. Propagation: Cutting or from seed. The seeds are quite easy to germinate and grow. Their main requirements consist of high humidity levels, free-draining soil mix, and enough water, light, and nutrition. The flower colour is not always true from seeds.